July 31, 2015 12:30 P.M.
Ontario is inviting the public to provide input on new proposed standards of care for marine mammals - such as orcas (killer whales), dolphins, beluga whales, sea lions and walruses - that will better meet their unique needs and ensure their overall health and well-being. 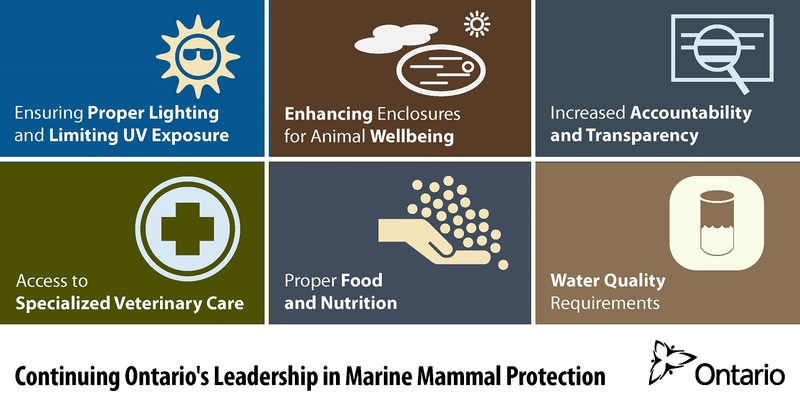 Ontario is the first province to propose clear and enforceable standards of care for marine mammals. The province recently passed Bill 80, the Ontario Society for the Prevention of Cruelty to Animals Amendment Act, 2015, which immediately prohibited the acquisition and breeding of orcas. This is the final part of the government's three-point plan to strengthen protection for all animals introduced in October 2012, which ensures that Ontario continues to have the strongest animal protection legislation in Canada. Ontario’s three-point plan to strengthen protection for all animals includes: new annual funding of $5.5 million for the Ontario Society for the Prevention of Cruelty to Animals; establishing a registry of Zoos and Aquariums; and reviewing and improving regulations to protect marine mammals in captivity. Ontario is the first jurisdiction in North America to prohibit breeding and acquisition of orcas. The enhanced standards reflect advice from an expert report commissioned by the Ontario government, led by Dr. David Rosen, a University of British Columbia marine biologist, as well as input from a Technical Advisory Group made up of veterinary, animal welfare, industry and enforcement organizations.